As a mom of three and a teacher who has worked with many children in my music studio for more than twenty years now, I have come to realize that if I could encourage parents along the journey with something in particular it would be in the area of life lessons. I believe it to be one of the biggest things that I would love for parents to hear and understand. Learning life lessons that enable children to become better, more responsible adults truly begins in our homes. Life lessons that include attitude, determination, and integrity are just a few lessons that are so important for today's youth. Reading this week here, I was surprised to find that many millennials when asked what age adulthood begins respond with the age of 30 or even 40! What?! How did this happen? Why did we allow them to believe that their adolescence should and could stretch this far? Unfortunately, I don't have all the answers! Sorry! I certainly don't have it all figured out in my own life or as a parent, but I do have some observations that I hope will be helpful. I do know that we can, as parents, take an active role in helping our children as they mature. We can then encourage those younger families coming behind us with young children of their own to begin the same process in their homes. While we can’t reap mature adults right away, we can begin to make progress and turn this ship around! One of the most recent internet sensations is a video from College Coach Geno Auriemma, Head Women's Basketball Coach, UConn). Coach was recorded talking about what he looks for in a player. He said today’s children come in trying to look like NBA players and are completely unteachable. He would rather recruit someone with a great work ethic and attitude and who is ready to learn. He actively watches body language in his players, and will sit players for bad attitudes even if it will cost him the game! This is exactly how we need to look at this with our own children! The awesome thing about this truth is that we all have the power to change our attitudes. It is absolutely within our control. We must teach our children this truth too, so that they don’t go from emotional drama to emotional drama. They have the ability to control their attitude. Because our attitude about life is completely controllable, we do not need to live our lives in a reactionary way and yet most of us do. Why? Because it’s so much easier. 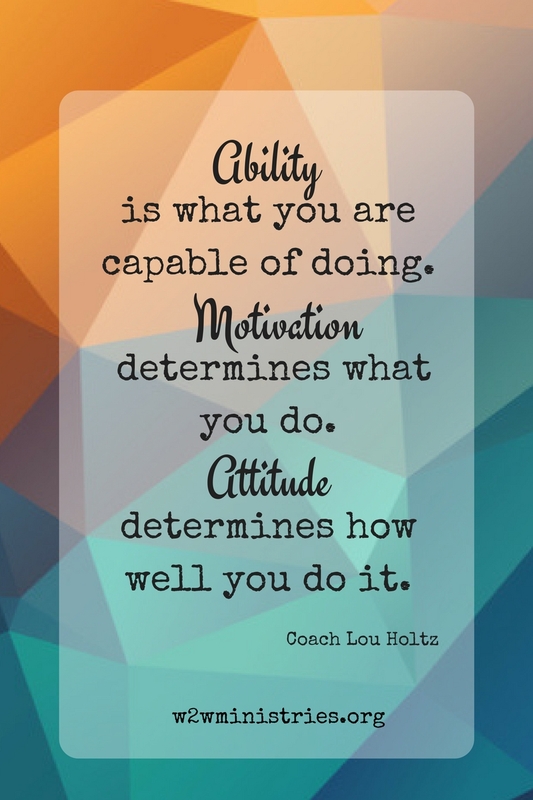 Taking control of our attitude is work and it’s a continual process. The Bible teaches us that this process is vital also! II Cor. 10:5 We destroy arguments and every lofty opinion raised against the knowledge of God, and take every thought captive to obey Christ. Paul exhorted the believers in Corinth to be mature in their thinking! I Cor. 14:20 Brothers, do not be children in your thinking. Our attitude is something that must be continually worked on. We get weary in the rigor of everyday life. Cultivating a positive attitude requires daily maintenance. How much more so in the lives of our children. Requiring a positive attitude and teachable spirit in our children is work and it requires constant maintenance. We must be careful to inspect what we expect and “prune” where necessary. If we can help them with this core value in their lives, we can have reasonable expectations for them to become responsible, mature adults one day. Encouraging them in their Christian walk to train their minds how to think will affects their attitudes in a positive way. We will give them a necessary tool to find success in their lives. Phil 4:8 Finally, brothers, whatever is true, whatever is honorable, whatever is just, whatever is pure, whatever is lovely, whatever is commendable, if there is any excellence, if there is anything worthy of praise, think about these things. 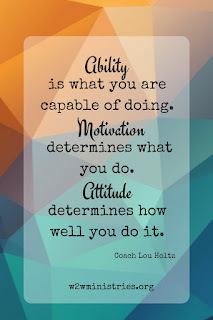 Successful people look back across their lives and decisions they have made and over time consistently see the cultivation of the habit of a positive attitude. As parents, there are many decisions, difficulties and life in general to deal with on a daily basis. Don't lose sight that how we parent today will affect the lives of our children and their futures. Keeping an eye on behaviors of today and correcting them as we go, will be so much more beneficial for our families than just getting through our day. Remember also that we need to demonstrate control of our own attitudes as well as we encourage our children in this area. If mom and dad consistently demonstrate bad attitudes, we can be sure we will see that show up in our children as well! The good news is that the reverse is also true. As we demonstrate a positive attitude, even in difficulty, and a teachable spirit, we will eventually see that in our children as well. They will catch so much more than we realize, so help them to catch the right spirit in their lives. Love this! Attitude is everything and I am constantly trying to work on mine.